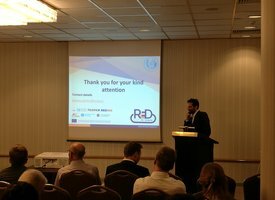 The RED Heat-to-Power project sent a strong representation to the conference "Desalination for the Environment: Clean Water and Energy" that was organised in on the 3–6 September 2018, in Athens, Greece. In total 5 presentations from the project were included in the programme, while the project had also space in the exhibition area. For more information about the project and its activities you can get in touch with the project coordinator WIP using the contact details below.